An easy software solution to enable you to control your computer, dictate emails and letters, and have the computer read documents back to you. Now you can tell your computer what you want it to do. These commands a built-in. You do not have to add or program them. Sometimes a program will simply ask you for a yes or no answer to an alert box or dialog. You can control when e-Speaking is "listening" to you using these voice commands. The Mouse Movement option has to be checked on the Mouse menu. Doing some word processing? These commands may help perform common Windows functions. These commands may help navigate documents. I've installed the software. Now what do I do? The installation program created short-cuts on your Programs menu and Desktop. Start the program the same way you would start any Windows program. The program will start in a "minimized" mode (i.e., it will show only the basic interface). You can view more elements of the program by clicking on the View menu and selecting Full-Screen. Or you can toggle the View mode by clicking on the "Menu" button that appears on the left side of the program. The program will start with the recognition and microphone turned on. You are ready to begin speaking to your computer. If you have Microsoft Word, you can say "Open Word" to start that application. You can say "Close Application" to close it. e-Speaking is downloaded with over 100 built-in commands. Please review them now. Access the Speech Properties dialog from the "Speech" tab of e-Speaking. If your name does not appear as one of the recogntion profiles, then click "New" to add it. Once added, make sure you perform the voice training ("Train Profile") and press "Apply" at the bottom of the dialog to save your changes. If you already have a Recognition Profile, you can perform additional training by pressing the button "Voice Training". Hands Speech does not require use of physical devices such as keyboards or pointing devices. Computing devices can become more compact as keyboard and mouse pointing devices take a less prominent role. Individuals with physical challenges may also benefit from the use of speech based applications. Eyes Does not require the use of vision. Speech can be performed effectively in low light environments or by persons with low or no vision. Applications for this technology may include uses where the individual needs to keep their eyes on equipment or the environment if navigating a vehicle. History People have been speaking for thousands of years and individuals start speaking at a young age. Distance Speech systems can process speech from individuals that may be at some distance away from the computer. Smaller Wireless and handheld devices are becoming increasingly smaller with corresponding smaller displays and input keys. A voice interface is not constrained by the physical size of the device. 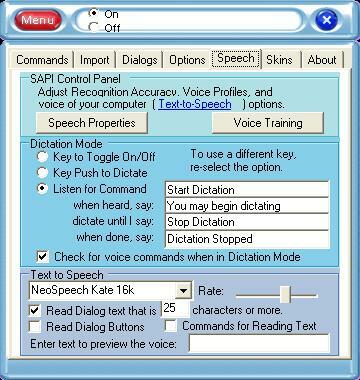 Speech Recognition is a technology that allows the computer to identify and understand words spoken by a person using a microphone or telephone. The ultimate goal of the technology is to be able to produce a system that can recognize with 100% accuracy all words that are spoken by any person. Even after years of research in this area, the best speech recognition software applications still cannot recognize speech with 100% accuracy. Some applications are able to recognize over 90% of words when spoken under specific constraints regarding content and previous training to recognize the speaker's speech characteristics. Computer software that understands your speech enables you to have conversations with the computer. These conversations would include you and the computer speaking as commands or in response to events, input, or other feedback. Speaking is easier and more intuitive than selecting buttons and menu items. Human speech has evolved over many thousands of years to become an efficient method of sharing information and giving instructions. Useful when accessing systems through pay telephones that do not have attached keyboards. Command and control your Window's computer through your voice. Operate your computer using a minimum of keystrokes or mouse clicks. If you want to move the cursor down one line, simply say: Down One. Want to check your emails? Simply say: Open Email. Add commands to open and control any Window's document or program. Utilizing Microsoft's Speech Application Program Interface (SAPI) and Microsoft's .NET Framework, we have developed a very small and efficient voice command and recognition application. SAPI and .NET are both required to use this software. Voice Dictation is integrated into the e-Speaking application including 26 different Dictation Voice Commands. Our intent in developing this product was to suppliment your ability to command and control your computer through your voice. To enable you to have access to dictation software using Microsoft's SAPI speech engine. And to allow the computer to read documents and emails to you. It's Free! That's right. You can download it with over 100 built-in commands and begin using it today and forever at no cost. Access the on-line user's guide.